Patrik Lindström Electro, Industrial This is the second EP from Machine Rox that I review and actually my comments don't differ so much from the first review. Richard of Machine Rox have a talent for making great melodies "Rock is Back" is the greatest example on this five track EP. The first tune called "Hello Danger" is also a favourite and like many of the tracks, it have a repetitive refrain that really sticks and is as hard to chase off as a hungry pack of mosquitoes. Unfortunately the last three tracks feel ways less inspired than the first two tracks, the great melodies are gone and by this you really start to grow a little bit tired of the hissing vocals. I think it would be a great step in the right direction if the hissing where mixed with regular and well performed vocals. That would really make it feel a little bit fresher. 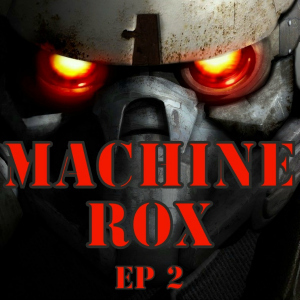 This is the second EP from Machine Rox that I review and actually my comments don't differ so much from the first review. Richard of Machine Rox have a talent for making great melodies "Rock is Back" is the greatest example on this five track EP. The first tune called "Hello Danger" is also a favourite and like many of the tracks, it have a repetitive refrain that really sticks and is as hard to chase off as a hungry pack of mosquitoes. Further more; there are still some mastering issues with this EP just like the prior one, the sound feels a bit canned and this digital release is far from having the same mastering work behind it as a real album release.